A ten-year scientific study into the nature of luck has revealed that, to a large extent, people make their own good and bad fortune. The results also show that it is possible to enhance the amount of luck that people encounter in their lives. Researched and published by Professor Richard Wiseman, The Luck Factor project scientifically explores why some people live such charmed lives, and develops techniques that enable others to enhance their own good fortune. 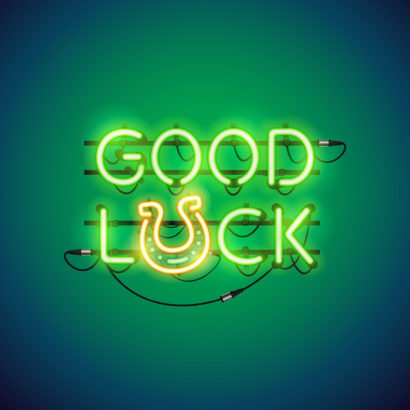 The research has involved working with hundreds of exceptionally lucky and unlucky people, and the findings have been published in The Luck Factor. Prof. Wiseman has identified the four basic principles that lucky people use to create good fortune in their lives. We found Professor Wiseman’s work through an adorable YouTube Video created by PBS. It goes a bit farther info the psychology of these 4 principles. Check it out here. ?? Thanks Professor Wiseman & It’s Ok To Be Smart ! Forbes.com carries Prof. Wiseman’s article on the psychology of opportunity. The Times reports Prof Wiseman’s work on creating opportunities and his book, Did You Spot the Gorilla?